Teaching young people across the country how to drive change through the political process. Generation Citizen’s action-civics curriculum is the driver’s education course for civic engagement. GENERATION CITIZEN BELIEVES ALL STUDENTS HAVE THE RIGHT TO LEARN HOW TO EFFECTIVELY PARTICIPATE AS CITIZENS. We inspire civic participation through a proven state standards-aligned action civics class that gives students the opportunity to experience real-world democracy. Through student-driven projects, youth learn how to effect policy change by engaging with local government and leaders to solve community problems. GC students receive an effective, action-oriented civics education that promotes long-term civic engagement and builds collaboration, communication, and critical thinking skills that students will need throughout their lives. The result is passionate and responsible civic participation that will help create the more active citizenry and more responsive government of our future. Ultimately, we believe that our democracy will work best if everyone participates. Therefore, our current efforts focus almost exclusively on eliminating the civic engagement gap by working with under-served youth populations in both rural and urban environments. 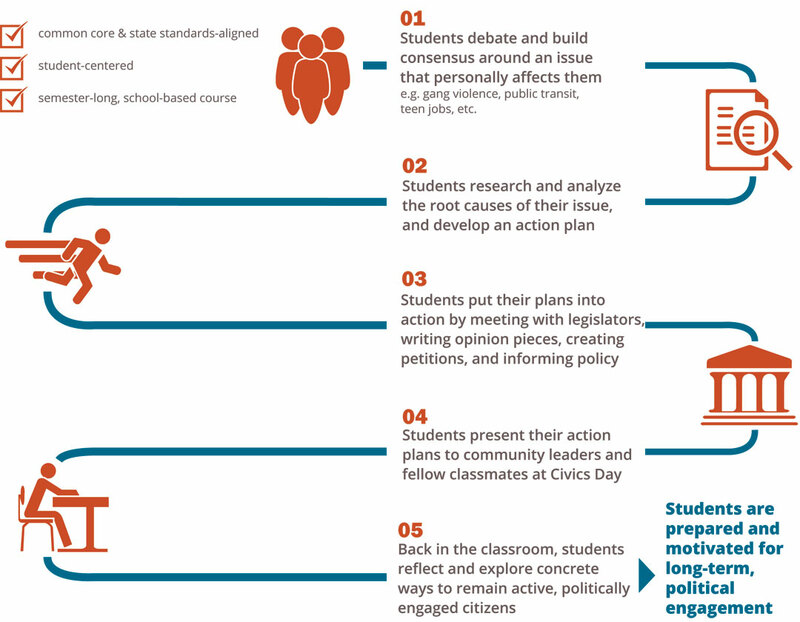 We work to demonstrate that Action Civics is a discipline that can be relevant in all school settings and locations with diverse political representation. We feel that we will best be able to achieve our ultimate mission by focusing our current work and resources on eliminating the civic engagement gap. SO WHAT IS ACTION CIVICS?